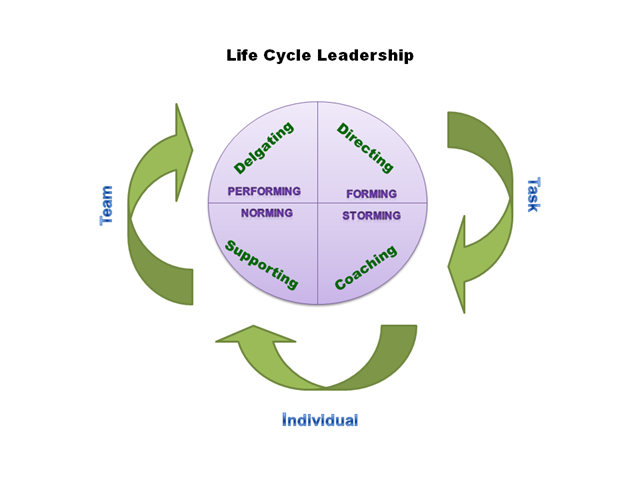 Leadership Styles – Life Cycle Leadership – different leadership styles are required across the life cycle of any group activity. Telling – at the start an activity, task or project, the individual, team or group usually know little about what is required of them and they can be confused and uncoordinated! Generally, they lack the specific skills required for this particular piece of work and they may not know each other. Lacking knowledge and confidence, they are anxious and unwilling to take responsibility for the task. The leader needs to go into “Telling” mode. This means being more directive; focusing on the task, promoting ownership by the individual team member and promoting their confidence. This Telling stage is characterized by one-way communication in which the leader defines the roles of the individual or group and provides the what, how, when, and where to do the task. Selling – as the group develops, the leader focuses on coaching to get them into the delivery stage! They agree how they will behave to complete the task! But in doing this there may be conflict and a leader may need a facilitative approach to lead them to resolution. They are still not able to take on responsibility; but, they are willing to work at the task. While the leader is still providing the direction and focusing on the task, he or she is now focusing as well on individuals using two-way communication – listening as well as giving instruction. The leader provides the coaching and support needed to help the individual or group buy into the process. Participating – as the individual or team becomes more confident and self managed the leader concentrates on leading the team overall and develops a delegating style! The team are experienced and able to do the task but may still lack the confidence to take on full responsibility. There is now shared decision-making about how the task will be accomplished and the leader generally provides far less instruction, concentrating instead on strengthening bonds and commitment within the group. Delegating – when the group is fully mature, the leader is still involved in decisions; but responsibility for how the task will be accomplished has been passed to the group. The leader stays involved to monitor progress. But the group are experienced at the task, and comfortable with their own ability to do it well. They are able and willing not only to do the task, but to take responsibility for its completion. I have described the stages in terms of group behaviour but the same cycle is seen in the development of individuals when they take on a new role. No one style is right for any leader all the time. Good leaders need the confidence to be flexible, and to adapt themselves according to the situation. The right leadership style will depend on the person or group being led. Life Cycle Leadership! The team behaviour theories of Tuckman and leadership theories of Hersey and Blanchard plus Adair can be brought together to into a simple model. This will show how different Leadership styles are required across the life cycle of an activity as illustrated in the diagram below. At the start an activity, task or project , the individual, team or group can be confused and uncoordinated! The leader needs to be more directive; focusing on the task at hand. They promote ownership by the individual or team member and encourage their confidence. There may be conflict. If so the leader uses a facilitative approach to lead them to resolution. As the individual or team becomes more confident and self-managed, the leader concentrates on leading the team overall and develops a delegating style! This is a new version of a very popular post on this site. I’ve written a lot about how teams behave and my approach has been based on Tuckman’s Team behaviour theory – you can find links to these articles at the bottom of this post. Tuckman’s approach and the leadership theories of Hershey-Blanchard and Adair can be brought together into one simple model. This shows how different Leadership styles are required across the life cycle of any group activity. If you would like support in developing your own leadership style, get in touch – my email address is below.